The Yosemite-close getaway introduces a vino-cool new to-do for fall 2016. BIG AND LITTLE THINGS: Yosemite Valley, it might be said with the utmost confidence, is full of Very Big Things, the sorts of sights and wonders that can't quite be described by a person throwing down a lot of baroque adjectives while describing what they've seen. There's Yosemite Falls, which is one of the planet's (and possibly the solar system's) most epic waterfalls in size, and there's Half Dome, a granite hunk so humongous that even words like "humongous" can't accurately convey its colossal-ness. 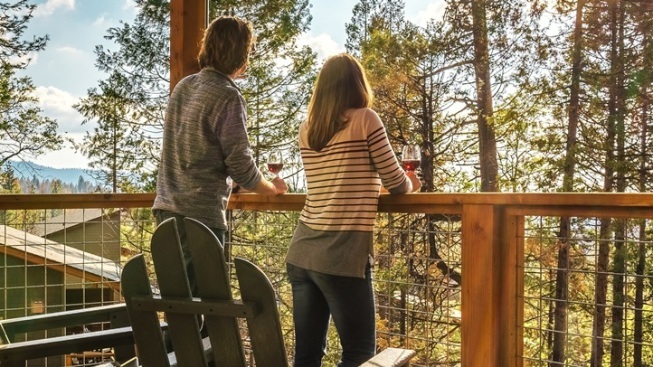 VINO TOURS: It's the Yosemite Cellars Vineyard Tour & Wine Tasting, and it is a fresh addition to the lodge's recreational offerings (fresh as of autumn 2016). Guides who know the area well will talk about the distinctive vinos that do best in and around Groveland, where Rush Creek Lodge is located. If taking in some mellow fall foliage goldenness while sipping a cab appeals, hang tight: The tour is on the way. But there are other experiences to choose from with the lodge as a springboard, including Guided Sequoia Hikes, Snowshoe Adventures, and a host of naturalist-led hikes to various destinations. Give the lodge a call for details.